Join our guided Grand Canyon hiking tour at the North Rim for 4 days of camping and exploring all that this high elevation plateau has to offer. We’ll spend 3 nights camped out under the towering pines and crisp star filled skies just a short walk away from the Grand Canyon North Rim. The hiking trails here lead to picturesque vistas and below the canyon rim to experience the magnitude of this natural wonder in a way that few visitors do. Choosing to visit the North Rim of the Grand Canyon allows us to escape 90% of the crowds and envelop ourselves in the solitude of the canyon. People often ask us “where is the Grand Canyon’s North Rim?” Sandwiched between the Arizona-Utah and the canyon’s edge, the North Rim is remote and unique. The weather in this part of Grand Canyon offers cool temperatures in the summer and winter snow that makes for a short visitor season. 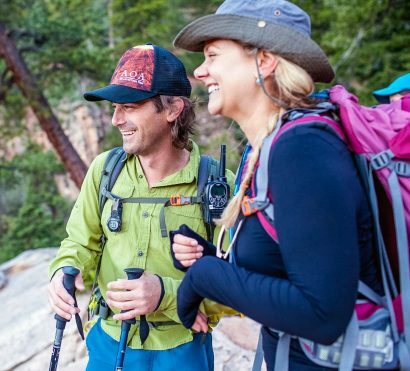 Perfect for groups of friends, active families, and single travelers, this guided adventure to the North Rim of the Grand Canyon provides comfortable camping, access to iconic and hard-to-reach wilderness areas, high adventure, and all logistics. With food, permits, available rental gear, and the complex details taken care of you can relax and enjoy your vacation. 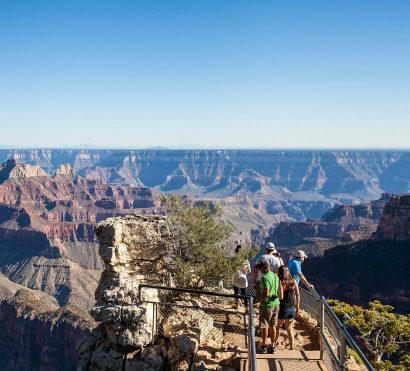 On this bucket-list 4-day North Rim Grand Canyon hiking tour, we visit one of the 7 Natural Wonders of the World, experience some classic Grand Canyon hiking, and explore the vistas and meadows along its high-elevation rim. We camp among the pines only a short distance from the canyon itself. 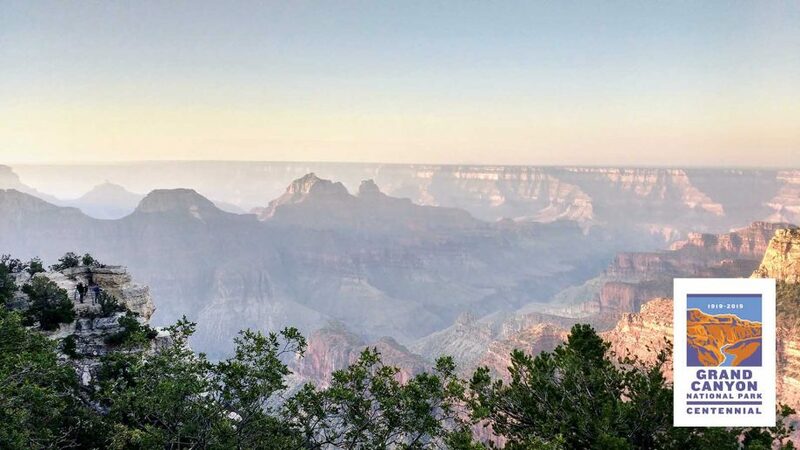 With only 10% of Grand Canyon visitors coming to the North Rim, and very few Grand Canyon tours coming this way, our group has the chance to find solitude and to fully absorb the grandeur of this incredible natural wonder. Our nights are filled with laughter around the picnic table, reliving memories from each day’s hikes, and colorful sunsets that morph into dark skies aglow with stars. 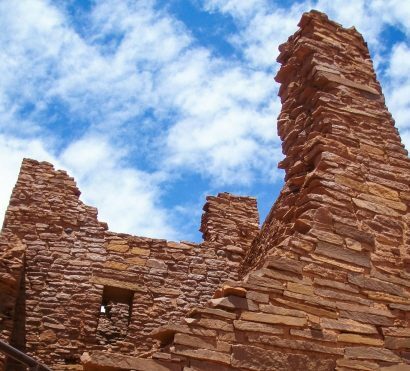 As if the Grand Canyon were not enough we’ll wrap up our journey by stopping at Wupatki National Monument to experience the remains of a once bustling Ancestral Puebloan village. Trip End: Ends in Scottsdale, AZ between 4-6pm on Day 4. Today we shuttle from Scottsdale/Phoenix to the North Rim of Grand Canyon National Park with some interesting stops along the way. There are a number of advantages to starting from Phoenix instead of starting your Grand Canyon tour from Las Vegas, including the incredibly diverse scenery along the way and interesting stopping points. One break is at Cameron Indian Trading Post; established in 1916, it is a famous showplace for fine Native American and Southwestern art, as well as a perfect lunch spot. After lunch we’ll get back on the road, skirting the edge of the colorful Painted Desert. 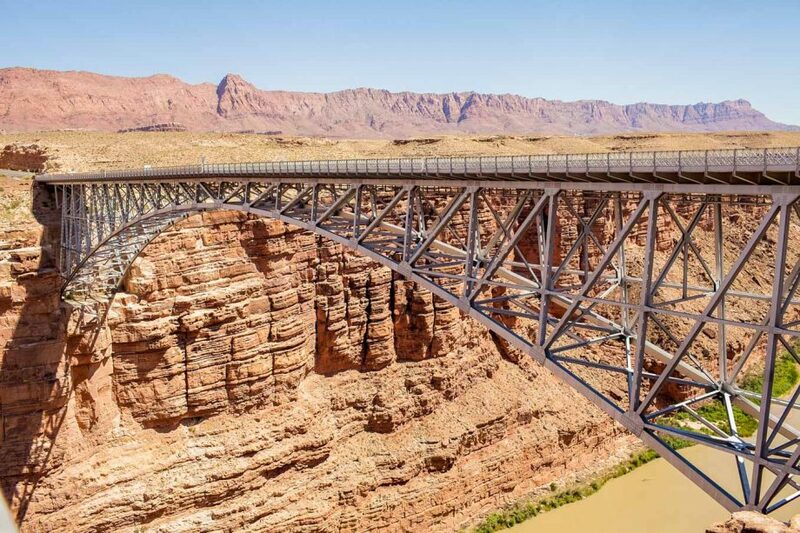 Once we cross the canyon-cutting Colorado River via the historic Navajo Bridge, we will start a gradual climb on to the Kaibab Plateau. We’ll have one final break at the tiny town of Jacob Lake to take advantage of their famous homemade cookies before we head out to our first hike where we have the opportunity to stretch our legs and get our first breathtaking views of the eastern rim at the northern boundary of the park. We will hike along the rim and out to Point Imperial; at an impressive 8,800 feet of elevation it is the highest viewpoint on the North Rim. This area is in recovery from a landscape-altering wildfire in 2000 and is a great spot to learn about the fascinating world of fire ecology. Day’s end will find us setting up a basecamp nestled within Grand Canyon National Park and enjoying a guide-prepared dinner in this spectacular setting. Get ready for a challenging trek into the heart of the canyon! Today’s hike starts with up to 4.7 miles downhill, a 3,050-foot descent into the grandest of canyons! Each step takes us thousands of years back in geologic time through ancient oceans, deserts, lakes, and swamps. 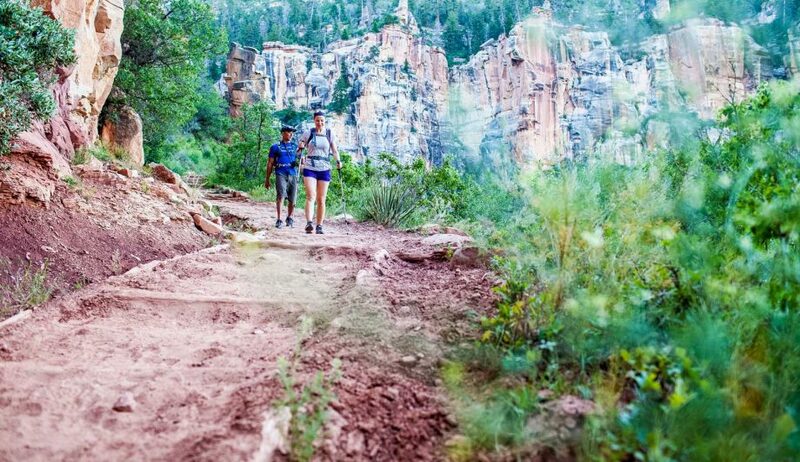 With mind-blowing vistas and fascinating trail design, the North Kaibab Trail will instill in you a new perspective on the magnitude of the Grand Canyon. Once down, we come upon the cascading waterfall of Roaring Springs, the water source for both the North and South Rim of the Grand Canyon. Today we’ll find a relaxing spot to enjoy lunch within the canyon before beginning the uphill portion of our adventure. The return hike to the rim will truly test your endurance and determination, but there is no feeling of accomplishment like the moment you reach the rim again. 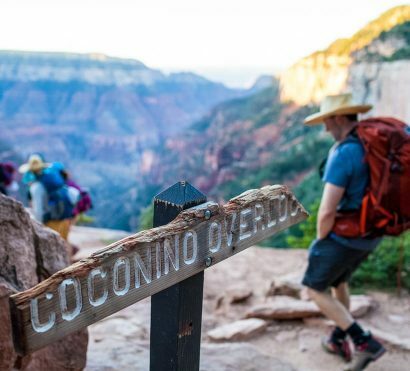 With your new perspective and the knowledge and stories passed down from your guide, you’ll get to the end of the day itching for more North Rim adventure. Today we will explore the wonders of the North Rim and really experience the spectacular alpine forests. We will hike the Widforss Trail along the rim and through meadows and beautiful forests to one of the finest views in the area. The namesake of the Widforss Trail is Gunnar Widforss, who lived at and painted the Grand Canyon in the 1930s and produced a wealth of watercolors that are now prized for how well they document the landscape and geology. At Widforss Point we will indulge in a rim-side lunch before hiking back to camp. Keep your eyes peeled for the wealth of wildlife on the North Rim. You’ve got a great chance at seeing the curious and unique Kaibab squirrel, plus mule deer, wild turkey, porcupines, and possibly some bison from a safe distance. Today we’ve taken the time to really explore the Kaibab Plateau and earned some breathtaking new views of the canyon. Tonight, we have one more delicious dinner to prepare for a sunrise hike like no other. This morning will be an early one so that we can catch a breathtaking sunrise at Bright Angel Point. Don’t sweat the early morning because your guide will bring coffee so you can enjoy a hot beverage while you immerse yourself in sunrise from this iconic viewpoint. After sunrise it’s time to enjoy a celebratory indoor breakfast at the iconic North Rim Lodge, one of the historic Grand Canyon hotels. Don’t forget to rub the nose on Brighty the Burro for good luck before we say goodbye to the canyon and transfer back to Scottsdale. On the return drive we’ll make sure to stop for a final guide-prepared lunch at Wupatki National Monument. Wupatki National Monument is situated between the picturesque Painted Desert and uplifted ponderosa forests of Flagstaff. 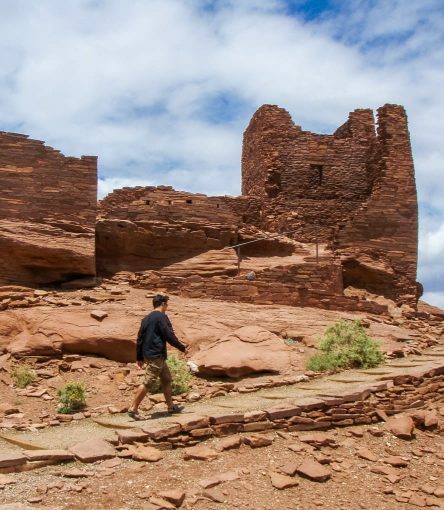 Though these lands once housed dozens of ancestral Puebloan villages they now stand as a silent monument of the bustling life and trade that once was. You should arrive back to the Holiday Inn Express in Scottsdale between 4:00 and 6:00pm. Cell service & Electricity: The Grand Canyon area has very limited cell phone service, you should expect to be unreachable by phone. While camping at Grand Canyon, the only electricity is in the public restrooms at the campground. Bring a portable phone charger so you’re not reliant on this power source. On this trip we camp in public National Park campgrounds that provide the best access to trails and canyon sights. We select sites with great bathroom and shower access, but we will have other travelers as neighbors and may occasionally hear the noise of cars passing by the campground. This trip involves long van transports, expect to be in the van about 6-6.5 hours during the drive to and from the Grand Canyon’s North Rim. The North Rim of the Grand Canyon is at a high elevation where the overnight lows can be very cold, even in midsummer. Day time temperatures can vary wildly on the North Rim.